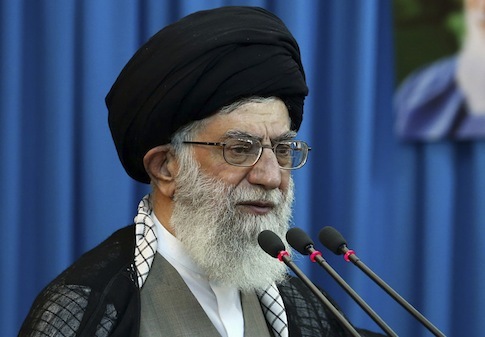 Supreme Leader Ali Khamenei warned on Wednesday that any new sanctions by the United States would effectively terminate the recently announced Iranian nuclear deal, which Khamenei officially endorsed Wednesday in a letter, according to regional reports. In a letter to President Hassan Rouhani released early Wednesday, Khamenei underlined his opposition to the United States but said that he endorses the accord reached between Tehran and world powers earlier this year in Vienna. However, if the United States does not fully terminate sanctions, the Islamic Republic will consider this a breach of the deal, according to Khamenei. This demand could cause trouble moving forward, as the United States has only agreed to suspend nuclear sanctions on Iran and maintain other sanctions on terrorist entities affiliated with the Islamic Republic. The Obama administration also has promised that if Iran breaches the deal or United Nations prohibitions—such as ones preventing Iran from testing ballistic missiles—it would move to reimpose the sanctions. Khamenei called this a deal breaker. "Any comments suggesting the sanctions structure will remain in place or [new] sanctions will be imposed, at any level and under any pretext, would be a violation of the JCPOA," he said in the letter sent to Rouhani, according to Iran’s state-controlled PressTV. Khamenei also "noted that any remarks by the other side [the United States] that says the structure of the sanctions will remain unchanged or imposition of any sanctions on Iran at any level under any pretext would translate into the violation of the" deal, according to the Islamic Republic News Agency (IRNA). The letter also reiterated Iran’s distrust of the United States, referring to it as "hostile and disruptive." Khamenei does not expect the nuclear deal will to thaw historically chilly relations between Tehran and America. In addition, Khamenei said that Iran would only give up its stockpiles of nuclear materials after the United States and global powers finish assessing the past military dimensions of Iran’s program. The Islamic Republic will also wait to refit the Arak heavy water nuclear reactor, which, under the deal, must be partly dismantled to prevent Iran from using it to fuel a nuclear weapon. The deal mandates that Iran consent to inspections meant to determine the extent of its past nuclear weapons work and research. Multiple Iranian officials have expressed their opposition to the deal in recent weeks, even as the Obama administration moves forward with sanctions relief that could total more than $150 billion. The suspension of sanctions is unacceptable to Iran. "The termination of the sanctions must be taken seriously. If they are terminated, it is a sign that the nuclear talks and agreement have yielded results," Ayatollah Ahmad Jannati, a senior Iranian cleric, said recently. "But if the other side breaks its promises and instead of terminating the sanctions [merely] freezes or suspends them, this shows that the nuclear agreement was useless." Khamenei has additionally declared that further "negotiation with America is forbidden." This entry was posted in National Security and tagged Ali Khamenei, Iran, Iran Nuclear Deal, Sanctions. Bookmark the permalink.